When people think of work, they very rarely think of their offices and what they do as sources of enjoyment. Work is usually synonymous with pressure, physical weariness and stress. It’s the very nature of work to put you through various challenges on pretty much a daily basis. Not many can say that their work doesn’t feel like work because most jobs have them meeting the standards established by others, and their efforts are often not meant for their own personal satisfaction but the satisfaction of others. Therefore, it’s completely understandable why the idea of enjoying every day at work is just deemed an ideal and great concept, but quite impossible in reality. It is not impossible, actually. There are ways for you to find both happiness and joy at work; as many and varied as these ways may be, one thing you’ll find is that they’re all rooted in the renewal of your mind. It’s all about possessing a different perspective of every workday so that whatever the drawbacks may be, your joy remains. On top of that, guided imagery is a fantastic way to relieve you of the stresses that work imposes. Through the suggestion of music or mantras, you can visualize being in a place that’s devoid of all the stressors wearing you down and preventing you from doing what you’re supposed to do at work. Alternatively, you may not see images in your head but your body may develop cozy sensations that slow it down and soothe it. It’s like an escape so you can come back to the “real world” feeling rejuvenated and clear-minded. 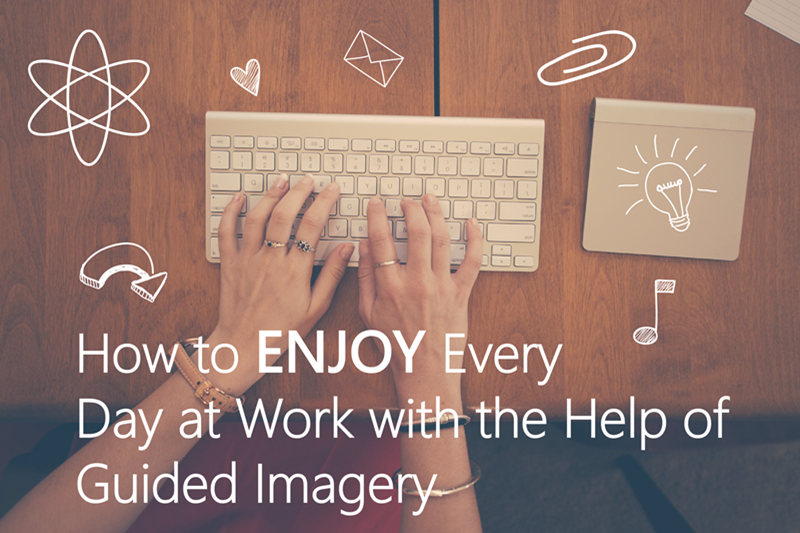 When you get a different perspective of things through the help of guided imagery, creating joyful workdays will be a breeze. You’re prevented from ruminating by actually focusing on yourself, which holds the solutions to all the challenges thrown your way. So join 10,000 people who get the best from each day—utilize guided imagery to alleviate work stress and put things in a positive perspective so that work situations won’t rob you of joy.